After 12 years, countless loads of laundry, and not one breakdown, my washer and dryer called it quits. 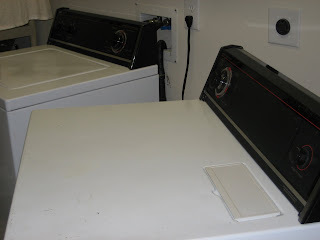 What are the chances of both dryer and washer dying just a few days apart? It's like one couldn't continue living without the other. This washer and dryer set was the first major purchase John and I made together. They saw us through 3 moves, including one across the country. 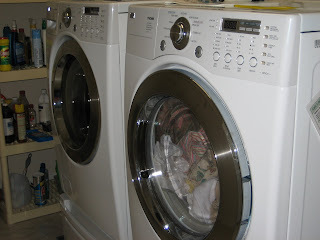 I washed newborn clothing for 3 children with this washer and dryer. I remember Madison climbing into the dryer with her blanket, pillow, and stuffed animal for a "hut." I was strangely sentimental to see them leave. Hello Lover Boys! We purchased the big daddys of all washers and dryers. I've never been so excited to do laundry! Not only because these machines are so cool, but also because Mt. Rushmore was as tall as I was because it had been over a week since I had done laundry. They worked beautifully! But there is one problem. With new machines, comes new detergent. One must use the detergent marked "HE" for front laoding machines. And this detergent smells. Very strongly! It's not a bad smell, but it is a very strong smell! You know how certain smells cause different emotions? Well, this smell makes me angry! 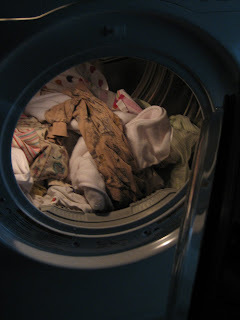 I've felt frustrated, overwhelmed, and tired of dirty laundry. But I have never felt violent towards my clean and folded clothing! But look, this is cool! You can do laundry in the dark because the dryer has a light!